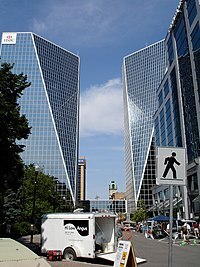 This list of tallest buildings in Regina ranks skyscrapers in the city of Regina, Saskatchewan, Canada by height. The tallest building in Regina is the Mosaic Potash Tower, which rises 84.5 m (277 ft). Regina is the capital city of Saskatchewan. As of October 2016[update], the city contains 5 skyscrapers over 75 m (246 ft) and 40 high-rise buildings that exceed 35 m (115 ft) in height. As of October 2016[update], there are 3 high-rises under construction, approved for construction, and proposed for construction in Regina. This list ranks Regina high-rises that stand at least 30.48 m (100 ft) tall, based on standard height measurement. This includes spires and architectural details but does not include antenna masts. Tallest building in Saskatchewan and tallest building between Calgary and Winnipeg. 39 Agriculture Place 42 m (138 ft) 10 2015 Tower two of the FCC complex built in 1992. List of high-rise buildings under construction, approved, proposed and on-hold in Regina. Capital Pointe 90 m (300 ft) 26 2018 On hold If built, will be the tallest building in Saskatchewan and the tallest mixed-use building in the Prairie Provinces outside of Calgary. ^ "Regina Skyscraper map". Skyscraperpage.com. Retrieved 2011-02-12. ^ "Regina Skyscraper Map". SkyscraperPage.com. Retrieved 2011-03-04. ^ a b "Mosaic Potash Tower, Regina". SkyscraperPage.com. Retrieved 2013-09-11. ^ a b "Delta Regina Hotel, Regina". SkyscraperPage.com. Retrieved 2011-03-04. ^ "McCallum Hill Centre II, Regina". SkyscraperPage.com. Retrieved 2011-03-04. ^ "CM Fines Building, Regina". SkyscraperPage.com. Retrieved 2011-03-04. ^ "McCallum Hill Centre I, Regina". SkyscraperPage.com. Retrieved 2011-03-04. ^ "Regina City Hall, Regina". SkyscraperPage.com. Retrieved 2011-03-04. ^ "Chateau Towers, Regina". SkyscraperPage.com. Retrieved 2011-03-04. ^ a b "Avord Towers, Regina". SkyscraperPage.com. Retrieved 2011-03-04. ^ "Roberts Plaza, Regina". SkyscraperPage.com. Retrieved 2013-09-11. ^ "FCC Tower, Regina". SkyscraperPage.com. Retrieved 2011-03-04. ^ "North Canadian Oils Building, Regina". SkyscraperPage.com. Retrieved 2011-03-04. ^ "The Hamilton, Regina". SkyscraperPage.com. Retrieved 2011-03-04. ^ "London Life Place, Regina". SkyscraperPage.com. Retrieved 2011-03-04. ^ "Alvin Hamilton Building, Regina". SkyscraperPage.com. Retrieved 2011-03-04. ^ "The Manor, Regina". SkyscraperPage.com. Retrieved 2011-03-04. ^ "TD Bank Building". Emporis. Retrieved May 31, 2012. ^ "Centre Pointe Plaza, Regina". SkyscraperPage.com. Retrieved 2011-03-04. ^ "Hotel Saskatchewan Radisson Plaza, Regina". SkyscraperPage.com. Retrieved 2011-03-04. ^ "Palliser Place". SkyScraperPage.com. Retrieved September 11, 2013. ^ a b "Legislative Building". Emporis. Retrieved May 31, 2012. ^ "Bank of Montreal Building, Regina - SkyscraperPage.com". skyscraperpage.com. Retrieved 2016-10-04. ^ "Conexus Plaza, Regina - SkyscraperPage.com". skyscraperpage.com. Retrieved 2016-10-04. ^ "The Canadiana Apartments, Regina - SkyscraperPage.com". skyscraperpage.com. Retrieved 2016-10-04. 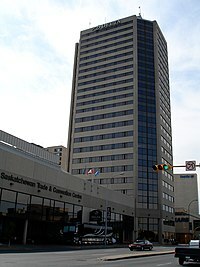 ^ "Saskpower Building, Regina - SkyscraperPage.com". skyscraperpage.com. Retrieved 2016-10-04. ^ "Grenfell Tower, Regina - SkyscraperPage.com". skyscraperpage.com. Retrieved 2016-10-04. ^ "Double Tree Hotel & Conference Centre, Regina - SkyscraperPage.com". skyscraperpage.com. Retrieved 2016-10-04. ^ "SaskTel Building, Regina - SkyscraperPage.com". skyscraperpage.com. Retrieved 2016-10-04. ^ "Cooper Place, Regina - SkyscraperPage.com". skyscraperpage.com. Retrieved 2016-10-04. ^ "Trianon Apartments, Regina - SkyscraperPage.com". skyscraperpage.com. Retrieved 2016-10-04. ^ "Embury Heights, Regina - SkyscraperPage.com". skyscraperpage.com. Retrieved 2016-10-04. ^ "Saskatchewan Wheat Pool Building, Regina - SkyscraperPage.com". skyscraperpage.com. Retrieved 2016-10-04. ^ "Drawings of University Residence South Tower - SkyscraperPage.com". skyscraperpage.com. Retrieved 2016-10-04. ^ "University Residence North Tower, Regina - SkyscraperPage.com". skyscraperpage.com. Retrieved 2016-10-04. ^ "Gardens on Rose, Regina - SkyscraperPage.com". skyscraperpage.com. Retrieved 2016-10-04. ^ "Wascana Energy Building, Regina - SkyscraperPage.com". skyscraperpage.com. Retrieved 2016-10-04. ^ "Victoria Place, Regina - SkyscraperPage.com". skyscraperpage.com. Retrieved 2016-10-04. ^ "The Hamilton, Regina - SkyscraperPage.com". skyscraperpage.com. Retrieved 2016-10-04. ^ "Agriculture Place, Regina - SkyscraperPage.com". skyscraperpage.com. Retrieved 2016-10-04. ^ "Canada Life Building, Regina - SkyscraperPage.com". skyscraperpage.com. Retrieved 2016-10-04. ^ "Centre Square Place, Regina - SkyscraperPage.com". skyscraperpage.com. Retrieved 2016-10-04. ^ "Timeline of tallest building in Regina". skyscraper.com. Retrieved 2011-03-03. ^ "Hotel Saskatchewan". skyscraperpage.com. Retrieved 2011-03-03. ^ "Tall tower proposal goes to Regina council". CBC.ca. May 25, 2010. Retrieved May 31, 2012. ^ "11th and Lorne Tower One, Regina - SkyscraperPage.com". skyscraperpage.com. Retrieved 2016-10-04. ^ "11th and Lorne Tower Two, Regina - SkyscraperPage.com". skyscraperpage.com. Retrieved 2016-10-04. Wikimedia Commons has media related to List of tallest buildings in Regina, Saskatchewan. This page was last edited on 22 March 2019, at 02:32 (UTC).